Up to now we have dealt with signals and recordings, and ignored the phenomenon of sound itself. But unless you are using headphones to listen to a purely electronic signal, there will be one or more stages in any chain of audio production that is mediated by real, acoustic, in-the-air sound. There is much to know about how sound is propagated through the air and how objects absorb, reflect, and emit sounds. In the context of this course we will only have room and time for the very basics. Air has mass, and it also acts as a spring--it can be compressed by applying force. Like any mass-and-spring system, it is able to store and transmit energy in the form of vibrations. In the particular case of air, these vibrations move in waves from one place to another. There are two kinds of variables to be concerned with: variations in air pressure from place to place and over time, and physical displacement of the air itself. At a given point in space and time, the pressure is a number in units of force per area (for instance, Newtons per square meter). One almost always speaks of the pressure as being positive if it is greater than atmospheric pressure, and negative if it is less - in other words, we tacitly subtract one atmosphere from the variables we use for pressure. The displacement is a vector; it has magnitude and direction. When the air is at rest the displacement is zero. When sound is present, the displacement changes with time and as a result the air also has a non-zero velocity that can be calculated from the displacement as a function of time. The sound first passes through an area called the near field, in which the strength and even the direction the sound is traveling in might vary from point to point. If, however, we go out to a distance several times the size of the source, we can say approximately that the sound is moving unidirectionally. 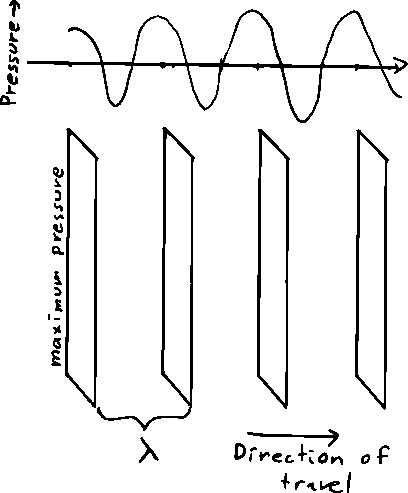 The pressure, displacement, and velocity of the air depend (approximately) only on one dimension, in the direction from the source to the listener. 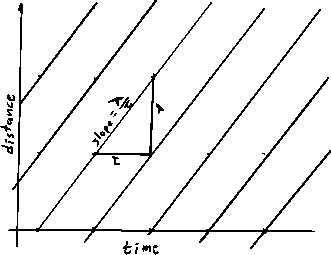 If the listener moves in a perpendicular direction to that axis, the sound is (approximately) unchanged. Sound travels at some 343 meters per second (in the air, at sea level; this varies slightly with temperature and altitude). In English units this is about 767 miles per hour, or 1167 feet per second, or, in very round numbers, about one foot per millisecond. This is the velocity of sound which we'll call . If the source and listener are separated by a distance , the sound arrives at the listener with a delay . If the delay is known, the distance can be found using . 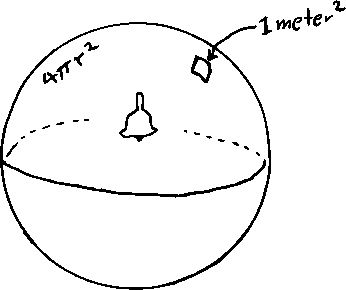 If the source and/or the listener is moving in space so that the distance between the two is changing, then the delay between the source and the listener changes as well. This results in a speeding up or slowing down of the sound. If the distance is changing at speeds much smaller than that of sound (usually the case in day-to-day experience) the relative speed change is minus the speed that the distance is changing, divided by the speed of sound. So, for instance, to get a transposition of one half tone (6 percent), one needs for the distance to change by 6% of the speed of sound, or about 46 miles per hour. If the distance is decreasing with time, the pitch goes up, and if it is increasing, the pitch goes down. Now increasing the distance to two meters reduces the power flow by a factor of four, and so the SPL goes down by 6 dB. To get the same SPL as before you'd need a four-watt speaker. Here is the peak amplitude, in units of pressure. The frequency is in cycles per unit time (Hz., for example), and is the initial phase at the origin where . The independent variables and don't appear in the equation; the pressure isn't changed if we move in the or direction. showing that at the point the initial phase of the sinusoid is . So anywhere in space we get the same amplitude and frequency, but a space-dependent initial phase. Placing two microphones (say, at points and will pick up sinusoids whose initial phases differ by . Here the horizontal axis in front shown distance in feet from 0 to 100, and the other horizontal axis (running from front to back in perspective) shows time from 0 to 0.1 second. To keep the numbers round, the speed of sound was rounded off to 1000 feet per second. The wavelength was chosen as 20 feet, corresponding to a frequency of 50 Hz. There are crests separated in space by 20 feet), and in time by 1/50 of a second. Over each period , the crests of the plane wave march forward units of distance, so that each one is replaced by the one in back of it. 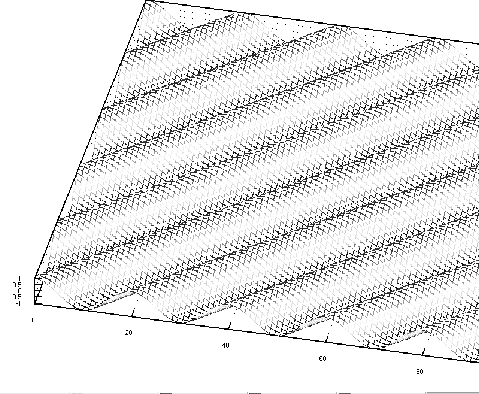 The slopes of the lines are all equal to , which equals . It is an interesting property of sound in the air that (for practical purposes) plane waves of different frequencies all move a the same speed . (This isn't necessarily true in other media, and is quite noticeably not the case in solids). To give an idea of the scale of reasonable wavelengths for sound: at 20 Hz. the wavelength is about 50 feet and at 20 kHz, it's about 0.6 inches. 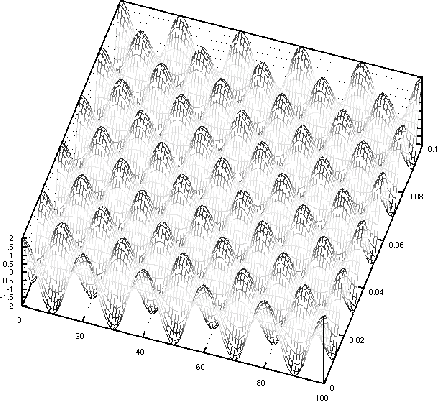 If an arbitrary sound is traveling unidirectionally (say, in the direction) it can, theoretically speaking and with some provisos,, be expressed as a s mixture of a (possibly infinite) number of sinusoidal plane waves, which correspond to the way its value at one point (a signal) could be written as a sum of sinusoids. In considering how a unidirectional sound behaves in space, it suffices to consider how its component sinusoids would behave separately. 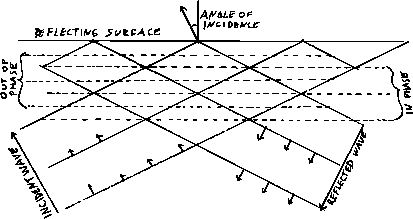 When a unidirectional sound encounters a flat, non-moving surface such as the wall of a room, it is reflected. If the wall is many times larger in both dimensions than one wavelength of the sound, its reflection is also approximately a plane wave. (So, if a sound has many frequency components, it might be observed that the higher frequencies in the sound are reflected roughly as light off a mirror, but that lower frequencies are dispersed in many directions. We'll return to this later; the effect is called diffraction. 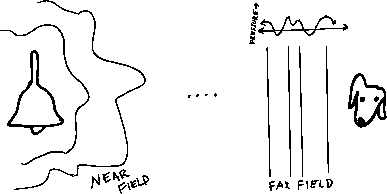 Focusing for now on the situation where the reflection may be considered a plane wave (as well as the incident wave), we can describe the whole sound field as a superposition (mixture, or sum) of two plane waves, with equal frequencies and amplitudes but different directions. There are evenly spaced planes (shown as horizontal lines parallel to the plane of reflection) where the two plane waves are in phase, and others where they are exactly out of phase and cancel. and if we sum them we can use my ``Fundamental formula of computer music"
1. A car is moving toward you at 60 miles per hour. Its horn is blowing at 440 Hz. By how many half tones does the sound rise above 440 Hz because of the car's motion? 2. Suppose the same car has the same horn blowing, but now you hear a pitch of 400 Hz. Assuming the car is moving directly away from you, how fast is it moving (in miles per hour)? 3. A sound has a wavelength of 4 feet. What is its frequency? 4. If two sounds are a perfect fifth apart, what is the ratio of their wavelengths? 5. Suppose that ten feet away from a loudspeaker the SPL is 60 dB. (and that the speaker is the only object making sound nearby). What is the SPL 20 feet away from the loudspeaker? 6. A 440-Hz. sinusoid is traveling in a plane wave in the direction. Two microphones are placed at and foot, respectively. What is the phase difference, in radians, between the signals picked up by the two microphones? The filter we'll measure is the bandpass filter supplied in the music 170 library (called ``bandpass"). It's a classical filter design that appears often in digital audio applications. To measure it, make a ``sinusoid" object and pass it through a ``bandpass" object. Make two ``meter" objects, and connect one to the output of the oscillator (so that you see what you're inputting to the filter) and one to the filter output so you can see how the two levels differ. If you want to save time later, you can slightly complicate the patch by inserting a multiplier between the oscillator and its two connections (with a constant to multiply it by) so that you can adjust the oscillator's output to a round number in dB; but this isn't necessary to finish the project. With these numbers evenly spaced on the horizontal axis (a logarithmic scale), plot on the vertical axis the gain in decibels (the output level of the filter minus the input level). These numbers will all be negative. (Suggestion: find all the 34 values first--each filter's gain at each of the 17 frequencies shown--so that you will know what the bounds of the graph should be.) Draw two traces, one for each of the two filters. Enjoy the fact that at high frequencies you get two nearly parallel lines. How many decibels per octave do the filters' frequency responses drop off by at frequencies above about 2000?